KURDISH FIGHTERS THWARTED a bid by Islamic State group jihadists to advance into the centre of the battleground Syrian town of Kobane early today, a monitoring group said. The attack came after the IS militants overran Kurdish headquarters in the border town on Friday, sparking fears they would cut off the last escape route to neighbouring Turkey for hundreds of mainly elderly civilians still in the town centre. The IS assault sparked 90 minutes of heavy fighting with the town’s Kurdish defenders before the jihadists fell back, the Syrian Observatory for Human Rights said. US-led coalition warplanes also carried out two air strikes on IS targets south and east of the town early Saturday, according to the Britain-based monitoring group, which has a wide network of sources inside Syria. Small groups of Kurdish fighters were trying to harry the encircling jihadists with operations across the front line, Observatory director Rami Abdel Rahman told AFP. UN envoy for Syria Staffan de Mistura warned Friday that 12,000 or so civilians still in or near Kobane, including 700 mainly elderly people in the town centre, “will most likely be massacred” by IS if the town falls. 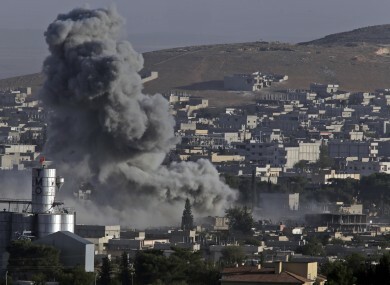 Email “Kurds fight back as Islamic State attempts to take centre of battleground city”. Feedback on “Kurds fight back as Islamic State attempts to take centre of battleground city”.